In 1995, Dr. Arlene Barro entered executive search after spending many years in high-level healthcare management and consulting. Accustomed to taking the road less traveled, she decided to create a method for presenting one Right Fit candidate to client-employers and conclude the search. Undaunted by the prevailing mindset that employers must compare and contrast many candidates to find the "best," Dr. Arlene determined that this mindset could lead to hiring the wrong fit. She told me what her dad taught her as a child about standards. "Don't pick the 'best' banana; select the one that meets your standards. If all the bananas are rotten and you select the 'best' you still have a rotten banana!" Eureka! 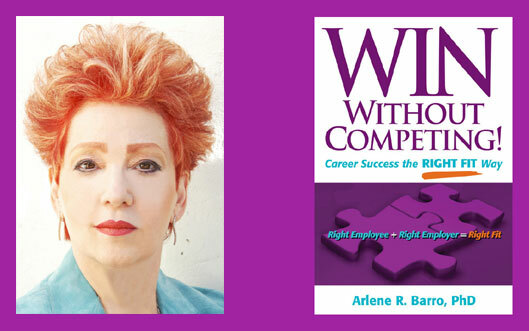 Dr. Arlene would, in concert with the employer, create a Blueprint of the Right Fit candidate. While writing WIN Without Competing! Dr. Arlene realized that her Method could substantially change not only your professional life but also your personal. That motivated her to write the final chapter "The Right Fit: An Approach to Life." Read Helen's story to find out how the Right Fit Method helped save her marriage. To learn more about the Right Fit Method, read the Right Fit Legacy.